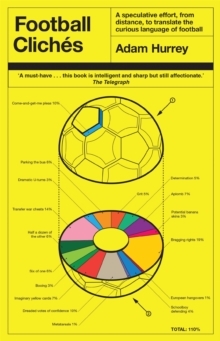 'A must-have' - The Telegraph'Book of the Week' - The Independent'Hilarious' - Sport MagazineIn what other context do football fans use the words 'aplomb' or 'derisory'? Why don't we use 'rifle' as a verb on the other six days of the week? Why do aggrieved midfielders feel the instinctive need to make a giant ball-shaped gesture with both hands after a mistimed tackle is punished? The more football Adam Hurrey watched, the more he began to spot the recurring mannerisms, behaviours, opinions and iconography that were mindlessly repeated in the football media. Some cliches are ridiculous, some are quaintly outdated, some have survived through their sheer indisputability. Here, featuring gloriously pseudo-scientific diagrams and the inimitable writing style that made footballcliches.com a smash hit, they are covered in all their glory.